Bahubali (One with strong arms), a much revered figure among Jains was the son of Rishabha (first tirthankara and founder of Jainism). Prabhas powerful portrayal in SS Rajamouli directed film ‘Babhubali’ hit the movie industry by storm – a totally unexpected high grosser, though Bollywood would compare it with Bjarangi Bhaijaan, which by nature had a wider audience. The movie was a fictional story of two warring brothers vying for control of an ancient Indian kingdom ‘Mahismati’ – besides powerful roles of Prabhas & Rana Daggubati with Tamannaah, Anushka Shetty, Ramya Krishnan, the Soundtrack and background score of Maragathamani Keeravani captivates so also is the cinematography and visual effects. 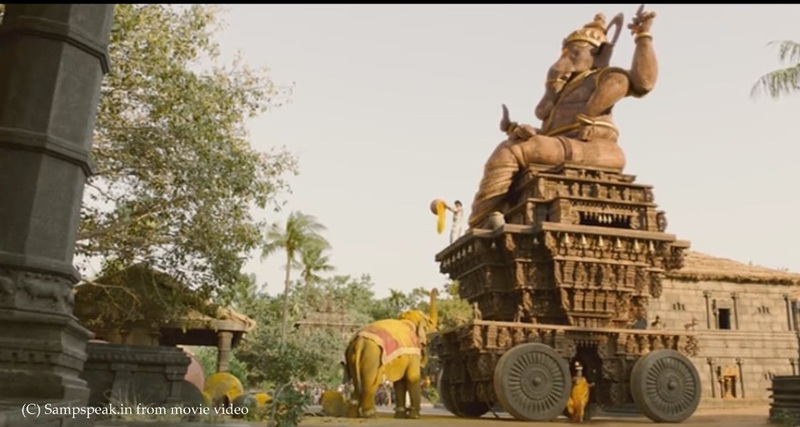 The movie occurs in the (fictional) ancient Kingdom of Mahishmati- the sequence starts with Sivagami, the queen mother (Ramya Krishnan), carrying a baby in her arms, emerges from a cave adjoining a big waterfall; is chased and kills the soldiers pursuing her and sacrifices herself to save the baby. ‘Bahubali – the beginning’ ended on a surprise note with revelation that it Kattappa who had killed King Amarendra Bahubali. Why did Kattappa kill Bahubali was the Q that left everyone imaginations kicking. In some interview, SS Ranamouli stated that he created the fictional kingdom of Mahismati, lying around a mountain and above waterfalls and for that he had extensively researched on 14th century kingdoms. From dressing to weapon design, language to romance, everything is fictional but yet looks like a fairytale– a web search has some interesting facts. The Avantis, the ancient people belonging to this realm were described as mahavala (very powerful) in the Udyoga Parva of the Mahabharata. There reportedly are some more references in Puranas too. Avanti, was an ancient Indian janapada (realm), roughly corresponded to the present day Malwa region. According to the Buddhist text, the Anguttara Nikaya, the janapada was divided into two parts by the Vindhyas, the northern part had its capital at Ujjayini and the southern part had its centre at Mahishmati. The film was exceptionally impressive creating newer heights of expectation for its sequel – ‘Bahubali: The Conclusion, or Bahubali 2’. The film had to bear the weight of that all-important question — “why did K kill Bahubali ?’ hubalikokyonmaara?” — that the open-ended climax of The Beginning threw up two years ago, but The Conclusion is much more than the answer to that question. It’s entertaining, it’s eyeball-grabbing and the moment you walk out of the theatre, you will want to walk right back in and watch it one more time ! The conclusion did not begin with the end of the beginning !! In another powerful portrayal – Sivakami walked fire while Amarendra Bahubali mounted the trunk of an elephant to tame it to submission to the great Vinayaka idol. Bahubali 2 is a story of love and loss, bloodshed and betrayal, revenge and retribution. From Arjuna, Karna to many many warriors, have all been exceptional in archery. In one particular sequence, Amarendra Bahubali teaches his ladylove Devasena how to defend herself from archers using three arrows at a time from a single bow? Four fingers, hold and turn – release 3 arrows at a time !! ~ simply beyond imagination one thought !! Now read this news in Daily Thanthi Next and in other newspapers ~ A team from Hosur Aram Archaeological Research Centre stumbled upon three hero stones belonging to the Vijayanagara period at Gikur settlement near Thally in Tamil Nadu. While two of the stones showcased warriors with three arrows in the right hand and a bow in the left, the scene seems to have unbelievable similarity to the war technique that the larger-than-life celluloid hero Baahubali had brandished. “They were once heroes like the fictional character Baahubali, who could shoot three arrows at a time”, Krishnan, who is the founder of the centre told DT Next. A memorial commemorating the honourable death of a hero in battle, hero stones were erected across the Indian subcontinent between the 3rd century BC and the 18th century AD. Explaining that the expert archers in the hero stones could have belonged to the Kangar community, who were hailed to be skilled warriors, Krishnan also said that the warriors depicted in the stones seem to have very different physique and hairstyles. These two hero stones found at Jihoor settlement near Thally, about 10 km from Hosur, could date back to the 13th and 14th century AD. They could have been carved in a gap of 50 to 100 years. “They are different persons as their physique and hair style are completely different. Long ago they could have been collected from different places and preserved between two Peepal trees that are more than 200 years old,” he said. Since these two hero stones did not have inscriptions the villagers did not know the value of the heroic deeds of the heroes, though they stand testimony to bravery of people of this region – which is only a few feet away from the Karnataka border. He said that more than hundred hero stones have been identified in and around Hosur. But over 95 per cent of them don’t have an inscription. Hero stones were carved to praise the heroics of a hero who got killed in battle or while protecting people from wild animals. Gikur is situated close to Tamil Nadu's border with Karnataka. Krishnan said the kings who ruled these regions might have deployed thousands of fighters on the borders to save their kingdoms from enemies.